LOVE. My blog is about my experience with LOVE. Everything about love inspires me and teaches me. Heartbreak inspired this blog, and is the hardest thing I have ever face in my life. I was almost destructed to oblivion, but from the ashes I emerged. I am surprised everday how much more I can do than I “believed” I was capable. Hi princessdeficit. Thank you so much for liking my poem ‘Empty Carriage and for following my poetry. Best Wishes. The Foureyed poet. I think it is courageous for people to blog about their experiences and deepest thoughts hopefully one day i will be able to blog my free mind.. that is why my blog is called FREE WiLL i release my work into the eyes of others hoping to get feedback from the free world and those interested in my artistry. I like your blog and the stuff you write keep it up. started from the bottom now one day i will get to where you are at. thank you for following me I appreciate it. Thank you for the advice and the follow you are my 5th follower i love wordpress lol. Is there any way to send you a private message? hi ytk. i have sent you an email. I no longer correspond via private email or chat. I almost always answer all questions on this blog, but unfortunately, I have projects im working on outside of blogging, and Limited time. I would like to help you as much as I can, but only via my blog. take care. you are very right when you say , ” no one can help you.” I learned the hard way. I was in so much pain, so many times i would call up my friends crying and then spend hours and hours talking about the same situation. I would just get in this mental loop which I called a merry-go-round of horror. I lost all my friends, and I can’t really blame them. Now I have no social contact and I stopped going over and over the horrible feelings I was feeling. The key is not to go in a circle, you have to get through it. Break the cycle. If you need to cry, then cry your heart out, but always get back up, wash your face, and try again, and you will see things get better. You may not be able to see your situation as a blessing right now, but you will realize, by not seeing it as a blessing you are causing more pain to yourself. Being thankful for what you had creates a positive emotion. Being bitter for what you lost causes you pain. The choice is yours. Take care. I have not had contact for almost one year. It was in some ways the longest but fastest year, strange how that happens. I don’t know if the goodbye is permanent, because I do not know what our future holds, but for now it must be this way. Who we were a year ago was just a toxic combination. He needs to figure out his life, and I most definitely need to figure out mine. I spent a good year regaining my health, my strength and my SELF. I never stop thinking sbout him, and it is painful but I know this needed to happen. I thought several times to contact him, you know the dreaded holidays or birthdays where you could technically send a greeting. However, I stopped myself, and thought, “NO.” “It’s much too early for that, and no good would come out of it. Even if we did get back together we would break up for sure. This one year has really been my rebirth. I fell in love, only to realize I wasn’t complete without someone. Then I figure out, I was COMPLETE, and would need to learn how to BE complete on my own. Love is separate. I will always love him. However. being complete on your own is possible, and extremely necessary. If ever our paths ever do cross, I hope to meet him when we are both complete. Only then do we have a second chance. I think knowing your future, would be the worst thing. you “think” you would feel better, but the truth is, nothing is going to make it better, but you. Focus on the now. The past is too painful to live, the future is impossible to live, so you are left with NOW. Live in the moment. What do you need to do right now. Clean your room? laundry? cook? focus on easy tasks, and one by one, time will pass, and you will get stronger, wiser, and your life will start to evolve the way it was meant to. take care. growing cold? Maybe this is a guy thing, because i could remember my ex/twin, started doing that whenever we broke up. he just emotionally shut off. I can’t do that. My emotions are extremely heightened. The only way i can function is to avoid, anything related to my ex, and to start a completely new life. You do not stop feeling because your twin leaves. You stop feeling only when you choose not to face painful situations and then emotional shut off. Don’t be afraid to feel the pain, it is the only way for transformation. Thank you for your kind words. I hold just as much admiration for your blog. Take care and best wishes. 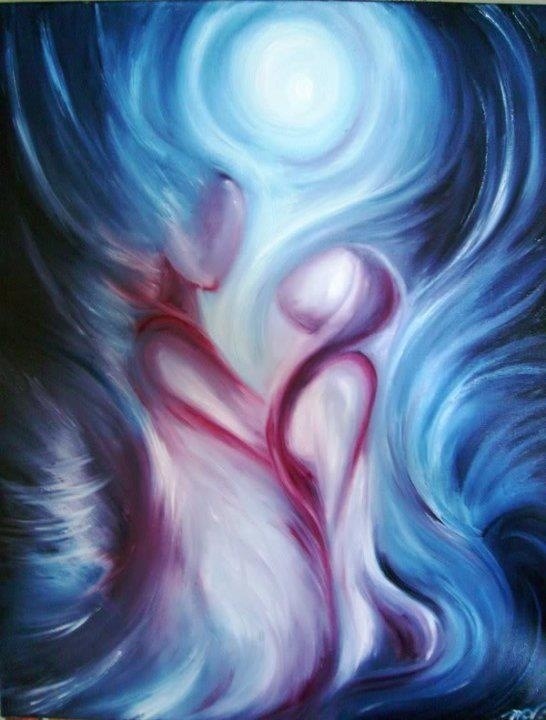 I’ve recently discovered my twin flame, I never heard the term used before, my daughter pointed out that we had all of the signs and when I started to learn about it, I was blown away! This is an amazing feeling! our story is quite remarkable to say the least! I was wondering if you had any information on one of the pictures on your website, I would love to find a print of it! I read all your blog posts just in one evening and I have a feeling that you are me, lol. Hope you have found peace and please post something soon. Since im experiencing a break up. I have been reading a lot of articles and stuff about soulmates and twin flames. Because I can sense, I can feel my ex, in mi mind, my heart, my stomach, my veins, my toes. And it’s driving me crazy. We are not together anymore but I can’t move on completely because I can sense when he’s sad or thinking of me. I just looking for a friends who understands me. And it’s not like there’s no one here to talk to. I just want to talk about this with someone who actually know what I’m talking about.